The thirty dollar surcharge represents a service, not a scam, says the electronics retailer. It came to light earlier in the week that a Best Buy store in Staten Island, NY, was charging an extra thirty bucks for the PS3. This extra charge was apparently to cover the cost of updating the firmware, which as most of you will already know, doesn't actually cost a bean. Many took Best Buy to task for this "scam," but the retailer has defended itself, saying that updating firmware is just one part of what the charge covers. Best Buy said that the charge was part of the "in-store and at home gaming set-up and customization services" it launched in 2008. The customers thirty dollars not only covered firmware updates, but also the creation of user accounts, the set up of parental controls, and a number of other components. In its statement, Best Buy said that it offered support on many of its products and games consoles were no different. 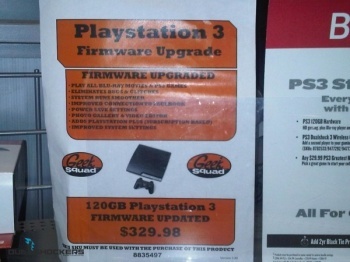 It was aware that many gamers would not need the facility that the Geek Squad - Best Buy's team of technical support staff - provided for the PS3, but that it was there for those that did. $30 for firmware updates sounds like a scam, but $30 for the peace of mind that if something goes wrong with your console you can call someone up and they will come and fix it? That's a whole other story. Most people, even those who are fairly technically minded, have probably encountered some problem that they wished they could offload on someone else, and that's exactly what this is. Admittedly, the signage could have been a lot better, but that's a whole other issue.